Unthinkable confrontations and familiar deal breakers spotlight danger and opportunity through this literary mix in calendar format. Flash fiction bites bring emotion, humor, and surprise endings early in each chapter. A bride gets embarrassed; a teacher gets exposed. Marilyn Brandt Smith is not content with limits on perception, imagination, and experimentation. She aligns differing literary forms, allowing the sun, moons, months, and seasons to chart the year. In a true story from March, two vulnerable women are held at knifepoint in an elevator. In May, young men lose track of their coach at the cave they’re exploring. April’s grass moon matches poems and stories about a famous disaster; a not-so-famous boarding school prank; an unusual burglary; and a bunny on a Greyhound bus. December promises satire; a special tree in Brooklyn that isn’t supposed to be there; and a glimpse of future technology. A counselor and teacher for people with disabilities, and a writer and editor for magazines, anthologies, and special formats, the author brings sensitivity, good humor, and creative variety to this collection. You’ll want to be part of it all—help the desperate woman in the hospital at midnight; put a stop to the husband’s game plan in Alaska. Stop and scratch their ears when you read about furry folk, and keep turning pages to see who’s next. 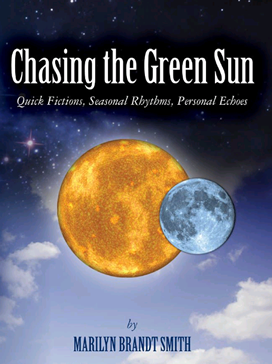 “Chasing the Green Sun: Quick Fictions, Seasonal Rhythms, Personal Echoes” is available from Amazon in both paperback and Kindle formats. It is available in audiobook format, narrated by a human reader, for people with visual impairment. Visit this page to download the audiobook version, free of charge.